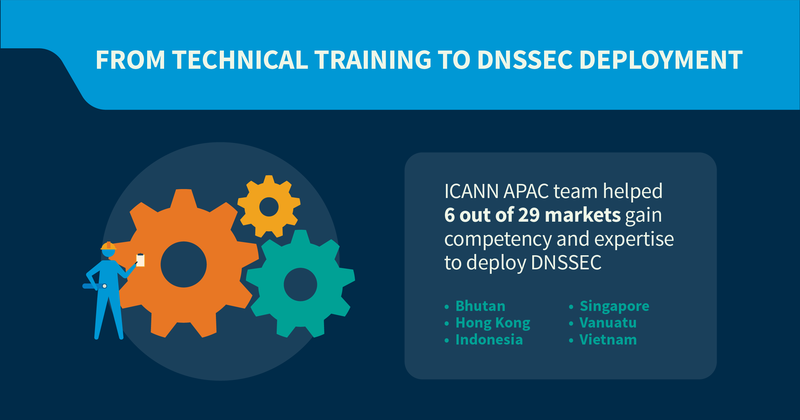 As we celebrate the fifth anniversary of ICANN's Asia Pacific (APAC) regional office, we've been reflecting on our training involvement with the community we support, and our collective contribution towards a more secure, stable, and resilient Internet. Our region is large, with some locations tucked in remote corners of the vast Pacific Ocean. It is also diverse, consisting of big and small economies, each at a different stage of development and growth. However one thing remains consistent – the ever-increasing demand for technical training and capacity development. During the last five years, we have offered over 110 technical capacity development courses and trained over 4,000 professionals in 35 countries. Recipients of our technical capacity development can be grouped into the following 'communities:' country code top-Level domain (ccTLD) operators, the Regional Internet Registry (RIR) community, Computer Emergency Response Teams (CERTs), Law Enforcement Agencies, Network Operator Groups (NOGs), government and regulatory agencies, and others. The courses offered include lessons on the Domain Name System (DNS), DNS Security Extensions (DNSSEC), network security, DNS abuse handling, cybersecurity, and much more. These training workshops last from three to five days, so out of the 52 weeks in a year, we are on the road conducting technical training nearly half the time! Our APAC community strives to build more secure and resilient networks. We share this same vision and have worked together tirelessly to achieve it. One key focus areas is helping to increase DNSSEC deployment. With limited resources, we struggle to meet the ever-increasing demand for technical capacity development. However, we remain committed to working with you. Looking ahead, we hope to work more closely with community members who can deliver trainings to their respective communities. This will allow technical trainings to be delivered in a more scalable manner. We are also working on providing more technical content on our e-learning platform, ICANN Learn. We hope that this will shorten the amount of face-to-face training required. Please take a moment to read our fifth anniversary report for a high-level infographic of our training coverage so far, and let's continue to work together to make the Internet more stable, secure, and reliable.